I was recently in SA Elite looking at their holiday sale items. They had ASICS running vests for 20% off, but the price still seemed high for a jacket without any sleeves. Since then, I read a piece on winter running that mentioned the benefit of keeping your core warm on very cold days. A warm core helps keep your extremities and the rest of your body warm. I didn't buy a running vest, but with this morning's wind chill, it felt like 28° outside. Rather than put on two long sleeve layers, I put on an acrylic fleece Sports Illustrated promo vest that I had from my Time Inc. days. The vest is lightweight and has a mesh liner inside. After a decade using it to keep warm in my office, it had a new use. After choosing the vest, I needed to pick the shoes I'd wear on today's run. I'm no longer concerned that the Kayanos are causing my sciatica, but I decided to go back to my Sauconys to see how they felt on a run. 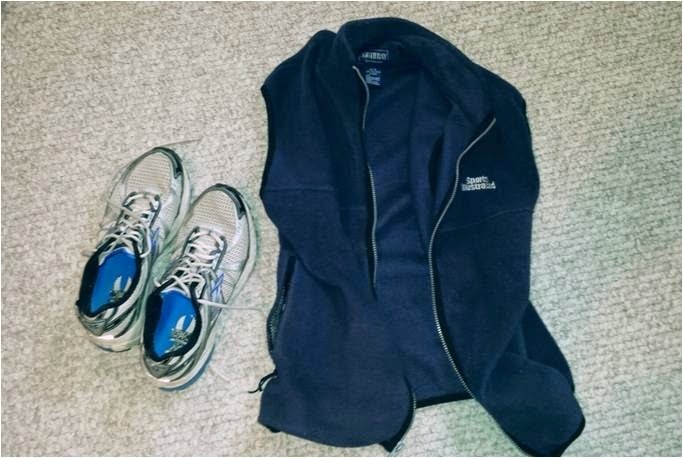 The appropriation of the vest as running gear inspired me to pull my ancient Brooks Adrenalin GTS 10s out of the closet and use them instead. The 10s probably have 1,000 miles on them, but they are still viable. I've always worn my Adrenalins when dealing with minor injuries because they seem to correct whatever problem is plaguing me. My shoe size has increased in recent years and the toe box is too tight for longer distances. If they were a half size bigger I'd put them into the rotation. The soreness in my glutes was there when I started, but it wasn't as pronounced as it was at the beginning of yesterday's run. I was hoping for a further reduction in the pain once I began to warm up. Some mild discomfort remained throughout the run. Surprisingly enough, I found the pain to be a good distraction from the boredom of my neighborhood roads. I decided to be cautious and keep the run under five miles today. I may go further tomorrow. I'm out of the office until January 5th so I'll have a lot more days to run during the week. I'm really hoping to be free of this soreness by the time me and my buddies do the LIRRC Hangover run on January 1.